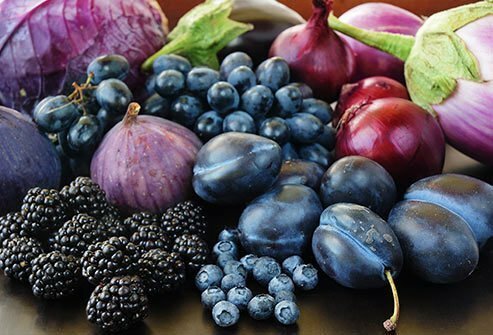 In fruits and vegetables, purple is often a sign of nutrients called anthocyanins. Like other phytonutrients, your body doesn't need them to work, but they do help protect your cells from damage that can lead to illness and disease. And that's on top of any other health benefits you'll get from eating these foods. They're one of the first purple foods people think of. And the more color in the fruit, the more of those anthocyanins. Riper fruits will also have more usable nutrients. The peel could have as much as 20 times the antioxidants as the flesh inside. Though anthocyanins are linked to the color purple, the pigments can range from red to blue. Blueberries, blackberries, strawberries, bilberries, black currants, and mulberries all have similar properties. They may boost your brainpower and your mood, according to studies of kids and adults using blueberries. Scientists think the anthocyanins help your brain cells talk to each other. Try the ones with purple skin and flesh. 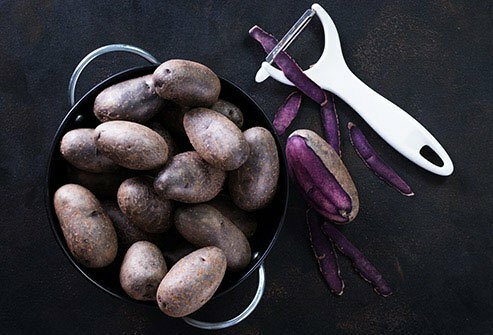 Besides anthocyanins, they have 2-3 times the total antioxidants of a typical white potato, which is loaded with potassium, magnesium, vitamin C, and fiber. 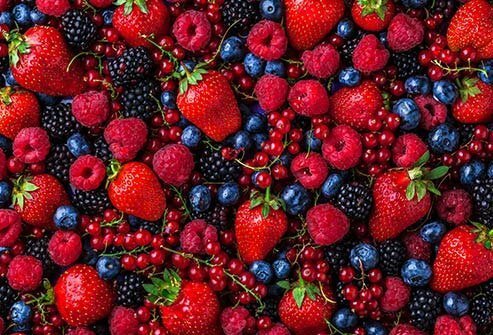 The anthocyanins that give them their dark rich color may help lower your blood pressure and keep your blood vessels healthy and soft. They also seem to help with joint problems like osteoarthritis and gout, a painful condition where crystals gather in your feet or ankles. 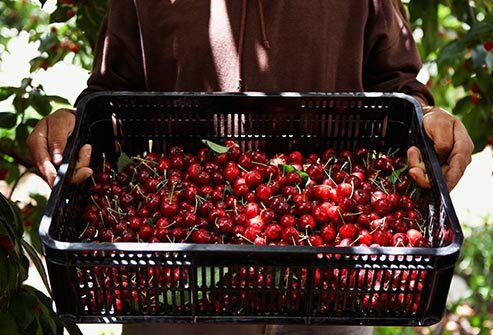 And cherries are bursting with nutrients that together may help prevent cancer, heart disease, and diabetes. The anthocyanins of grapes can run from red to black. These juicy gems are known for having resveratrol, which has gotten a lot of attention for being part of a group of nutrients that work together to help protect your cells from damage that can lead to disease. The skins of grapes give red wine its color -- and its resveratrol. 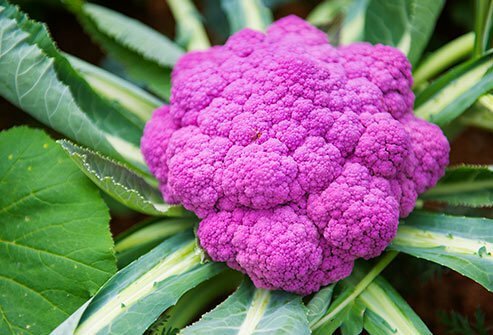 Just a single gene tells a cauliflower to gather more anthocyanins into its tissues, turning this normally white vegetable purple. Otherwise, it's like the stuff you already know: rich in phytonutrients, vitamin C, and minerals. Steam, stir-fry, or microwave -- or eat it raw -- to preserve the most nutrients. Find them at your local farmers' market or foodie restaurant. Try them roasted, pickled, or broiled. 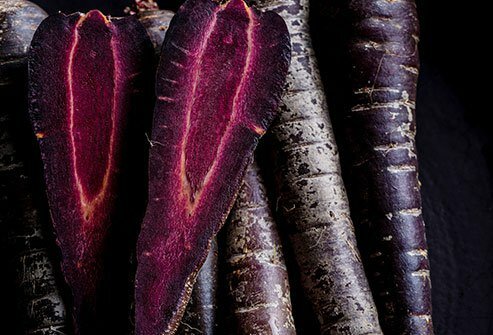 You'll get their extra anthocyanins as well as the beta carotene and other carotenoids found in orange carrots that may help stop cancer and improve your immune system. It may be easier for your body to use its anthocyanins when you cook it. 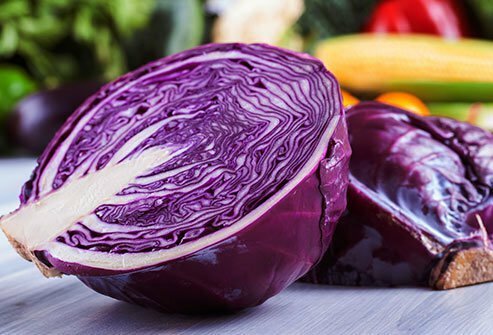 And when you ferment cabbage to make sauerkraut or kimchi, you'll get natural probiotics that nourish the bacteria in your gut -- your "microbiome." These help your body fight germs, absorb nutrients, digest food, and even control anxiety. Their color comes from different antioxidants called betalains instead. You'll also find these red and yellow pigments in the stems of chard and rhubarb, as well as some mushrooms and fungi. They break down more easily when you cook them than anthocyanins do, so try steaming rather than roasting. Beets will add sweetness and a beautiful purplish-red color to your smoothies. These veggies are good for your heart, brain, and blood sugar. No, the color of processed foods like cakes and candies doesn't mean the same things it does in fresh fruits and vegetables. But anthocyanins are often used to give dark color to other foods like blue corn chips, soft drinks, and jellies. The amount may not be enough to change your health for the better, yet they can be a safe choice if you want to avoid artificial dyes. "Anthocyanins," Pennington Biomedical Research Center, 2009. 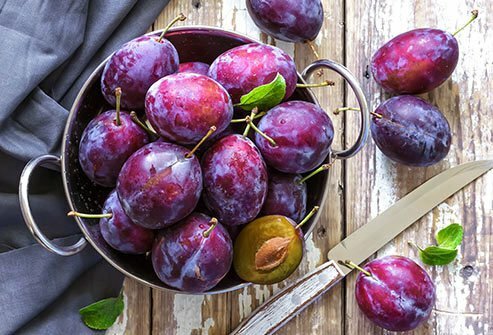 Journal of the Science of Food and Agriculture: "Phytochemicals in fruits of two Prunus domestica L. plum cultivars during ripening." 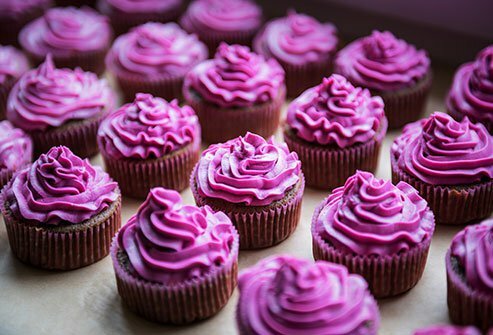 Food & Nutrition Research: "Anthocyanidins and anthocyanins: colored pigments as food, pharmaceutical ingredients, and the potential health benefits." Journal of Agricultural and Food Chemistry: "Blueberry Supplementation Improves Memory in Older Adults," "Anthocyanins in purple-orange carrots (Daucus carota L.) do not influence the bioavailability of beta-carotene in young women." Advances in Nutrition: "White Potatoes, Human Health, and Dietary Guidance." American Journal of Clinical Nutrition: "Effects of Montmorency tart cherry (Prunus Cerasus L.) consumption on vascular function in men with early hypertension." Critical Reviews in Food Science and Nutrition: "Cherries and health: a review," "Grape phytochemicals and associated health benefits." 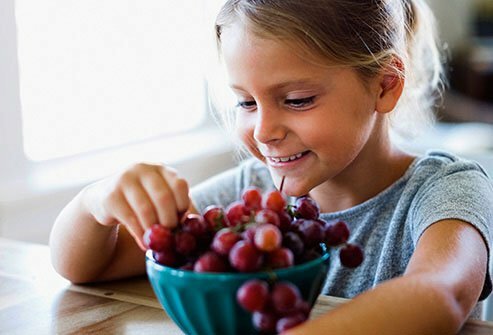 Journal of Nutrition: "Unraveling the Relationship between Grapes and Health." Plant Physiology: "The Purple Cauliflower Arises from Activation of a MYB Transcription Factor." BioMed Research International: "Bioactive Compounds and Antioxidant Activity of Fresh and Processed White Cauliflower." Harvard Health Publishing: "Nutritional psychiatry: Your brain on food." CNS & Neurological Disorders Drug Targets: "Gut emotions -- mechanisms of action of probiotics as novel therapeutic targets for depression and anxiety disorders." Journal of Applied Microbiology: "Probiotics and their fermented food products are beneficial for health." Psychiatry Research: "Fermented foods, neuroticism, and social anxiety: An interaction model." Kansas State University News Services: "The power of purple: Purple foods provide healthy nutrients and antioxidants." U.S. Department of Agriculture National Nutrient Database for Standard Reference, release 28: "11080, Beets, raw." 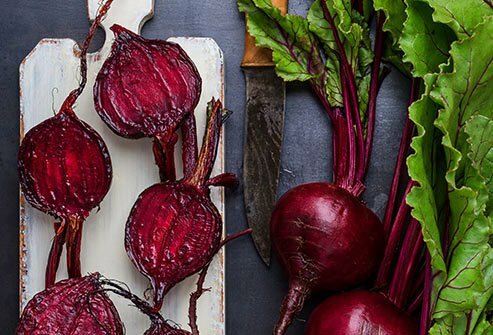 Nutrients: "The Potential Benefits of Red Beetroot Supplementation in Health and Disease." ChemMatters: "Eating with Your Eyes: The Chemistry of Food Colorings." Environmental Health Perspectives: "DIET AND NUTRITION: The Artificial Food Dye Blues."